Enjoy the top 1 famous quotes, sayings and quotations by Joseph Rusling Meeker. All of the elements of the comic way tend to spread to others, insinuating joy where it was previously absent. Conversation has a way of leaping among persons, as it does at parties and celebratory gatherings. Storytelling always begets storytelling. It is difficult to watch others at play without wanting to join them. This is not only a human phenomenon, for researchers have consistently noted that animals at play are often imitated by other animals. So wherever it is possible to initiate a playful activity, it will have a good chance of replicating itself through other parts of the system. Want to see more pictures of Joseph Rusling Meeker quotes? 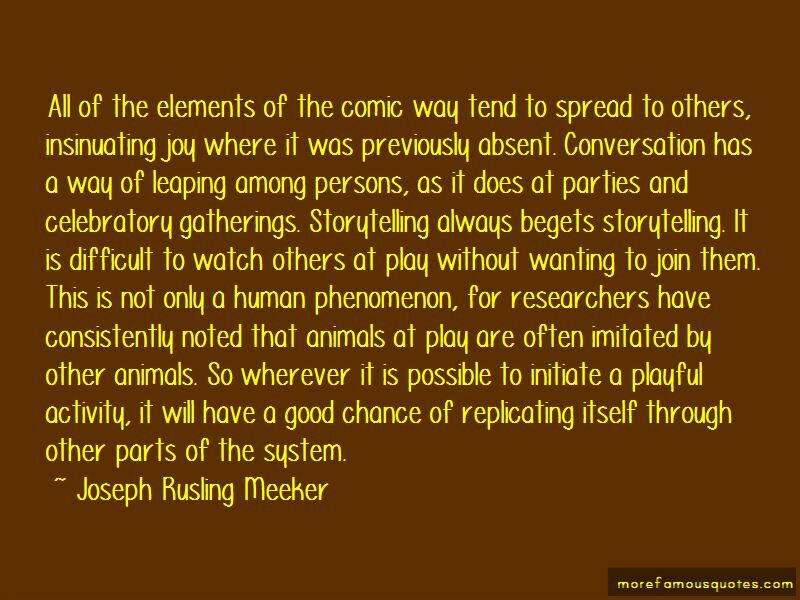 Click on image of Joseph Rusling Meeker quotes to view full size.